"Motion controlled" remote control supports gaming; Flawless media playback with support for all major formats; 4x USB 2.0 ports, DLNA and Samba share for Windows. Takes over two minutes to boot; Occasional lag. Media players have become very common these days and the plain old media players have been pushed to obsolescence by newer devices based on Android OS. The advantage of these Android media players is that they can adapt and be upgraded to support newer codecs as and when required. Also, these are known to play 1080p content easily and also bring the glory of millions of apps and games from Google Play Store. Amkette has launched the EvoTV XL, which is an upgraded version of the EvoTV it launched mid of 2012. Let's take a look at whether it is really worth its price. The EvoTV XL is housed in a small greyish-black polymer box with rounded vertical edges and hard horizontal edges. In fact, it looks eerily similar to the STB that comes with the Apple TV, only that it is a little larger. The top surface has a matte finish and hence doesn't gather fingerprints. The construction is very sturdy as the unit managed to survive an accidental fall from a metre high on hard surface without a scratch. It has dimensions of 4.6" (w) x 4.6" (d) x 1" (h). Four small rubber feet at four corners underneath help to keep the unit firmly grounded on the surface where it is placed. There are several heat vents to let out hot air and let in cool air. There are three USB 2.0 ports and a SD/MMC memory card slot on the right side, while there is nothing on the left. The remaining ports are present on the rear and these include a fourth USB 2.0 port, HDMI-Out to connect to high definition displays, AV port to connect to analogue televisions via the bundled cable, SPDIF (Sony-Philips Digital Interface) to connect to supporting audio devices, Ethernet port to connect to wired networks, and power adapter connector. Since Wi-Fi is built into the device, you don't need a separate adapter. A blue LED on the front lights up when the device is powered on. 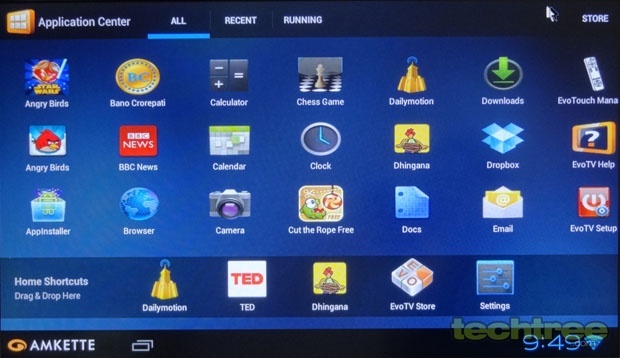 On the hardware front, the EvoTV comes with a customised version of Android 4.0.4 (Ice Cream Sandwich) and is powered by an ARM Cortex A9 CPU and ARM Mali 400 GPU. It has 4 GB internal storage and 1 GB RAM. 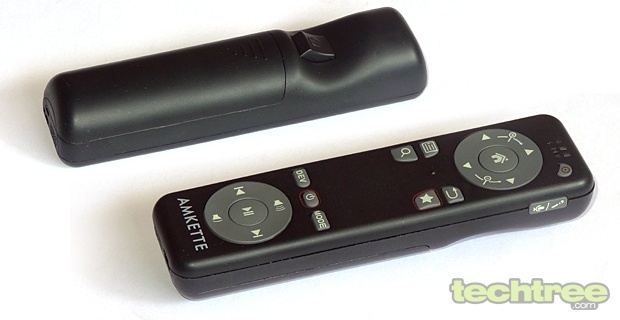 The Amkette EvoTV XL comes with a remote control that doubles up as a motion sensing controller to play games on the device. Looking very similar to the Nintendo Wii remote, it even has the wrist strap and is shaped like a stick rather than being flat like normal remotes, making it easy and comfortable to get a grip on. There are two touch-sensitive pads, one near the top and one near the bottom, mainly useful while gaming. It functions as an Air Mouse with the click button present on the underside. It also has a speaker and microphone that can be used for Skype chat without having to be near the EvoTV XL. We found that the remote control works even from as far as 5 metres (a little over 15 feet) from the device, but connectivity becomes erratic if you take it any further. Basic functions such as play, pause, forward, rewind, and volume are supported, but buttons for functions manage subtitles, audio selection, or even a mute button. It is powered by an inbuilt rechargeable battery that can be charged via the bundled mini-USB cable. The remote control has a great build quality. 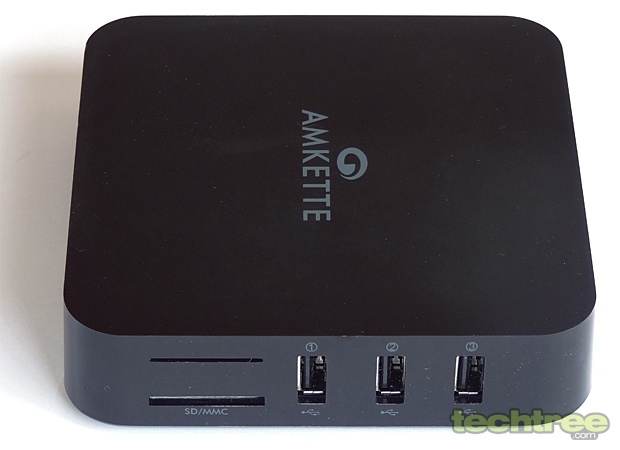 In addition to the remote control, Amkette bundles along an HDMI cable and an AV cable to connect to display devices. A power adapter, USB data cable, and quick start guide are also included. The EvoTV XL takes just around two minutes to boot once powered on. This is a considerable amount of time as it is slower than other non-Android media player, or even a PC. 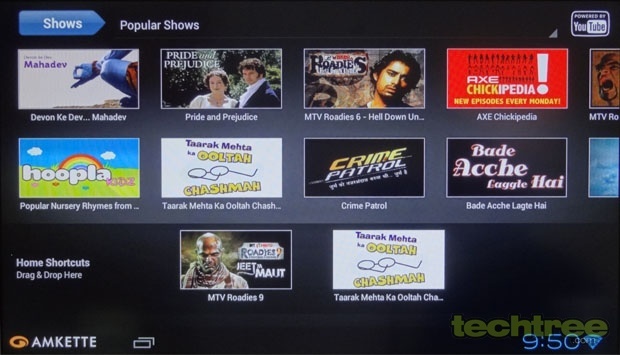 The customised UI has several sections such as YouTube Viewer, Applications, Web, Media Center, TV Shows, and Games. As it should be, we will first take a look at the media player functionality. Media playback is achieved via the customised media player that can handle most video, audio, and image file formats. You can connect several external storage devices at a time and also access them simultaneously. The on-screen controls are similar to what you see in stock Android media players. Media playback is flawless at 720p as well as 1080p at 50 and 60 Hz and at no point did we notice any stutter. Subtitles are supported in several different file formats. You can always install another media player such as MXPlayer for more format support. Up to 7.1-channel audio output is supported via HDMI as well as SPDIF, provided you have a capable sound system. 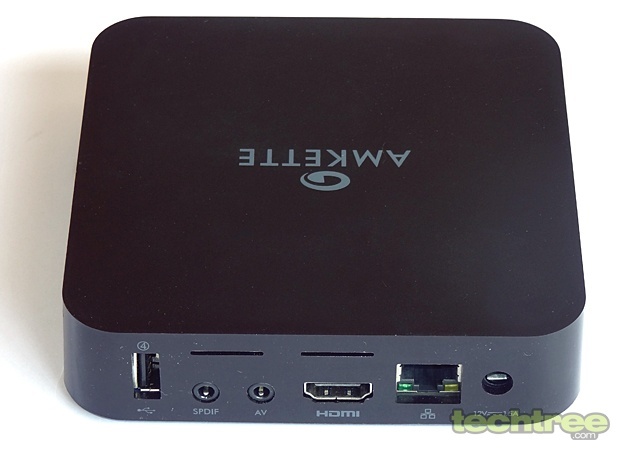 Additionally, it also incorporates XBMC, which is supposed to be the best open source media player out there. Because this runs Android Ice Cream Sandwich, it supports DLNA and Samba Share file sharing that can be used to stream your videos using this device. Gaming is actually a joy using the motion control capability of the remote control. I tried my hands at a few games such as Angry Birds and Cut The Rope and found that it is really fun to play using the remote. You only need a few minutes to master this controller and will probably not play the game any other way once you do. There are quite a few other Android games that you can download and enjoy this feature. You can browse websites with full support for Adobe Flash as well as chat with your friends using IM services such as Skype. There are apps dedicated to support various social networks. YouTube Viewer and My YT sections allow you to view online streaming videos. There is a TV Shows section that has a selection of Indian TV serials that can be viewed online. 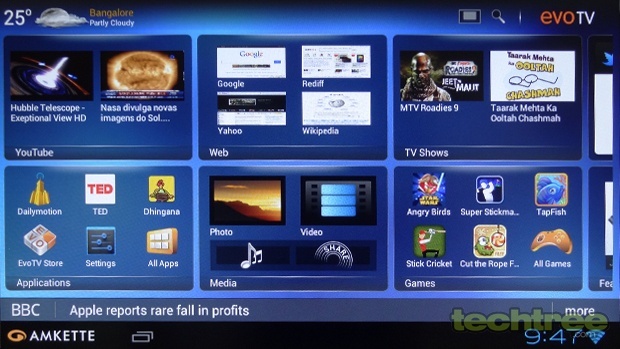 The EvoTV Store is a customised version of Google Play that lets you purchase and download apps and games to the device. You can also do the same directly from Google Play Store. An interesting application of this device is that it can serve as a low-cost (due to low power consumption) download rig using the pre-installed tTorrent client and an inexpensive USB flash drive plugged into one of the ports. The device supports any USB keyboard and mouse that can be plugged into one of the four USB ports to turn it into a complete computing machine. The OfficeSuite that is pre-installed ensures good productivity or you can even install another free office application such as from Kingsoft. Accessories such as the Truview camera can work with the EvoTV XL for video chat on Skype and other apps, and it should also work with a standard USB webcam. Unlike its predecessor, this device does not heat up even after hours of usage. The power consumption hovers around 5 W during 1080p movie playback and seldom goes to 7 W even while gaming. The Amkette EvoTV XL is more than just a media player, it actually converts your boring plain TV into a Smart TV and adds real gaming capability to it, thanks to the unique motion sensing remote control. It can also act as a computer, thanks to the ability to connect USB keyboard and mouse and the presence of several office suites and other productivity apps to choose from. Internet connectivity also lets you use features such as browsing the web, social networking, watching streaming media and TV, IM chat, and download torrents. DLNA lets you stream movies to compatible devices. Of course, it works very well as a media player even with high bitrate 1080p movies. The UI is very smooth and there is only an occasional lag which cannot be termed as a negative. With support for Google Play Store and Amkette's own store, you can download and install a myriad of apps and games. 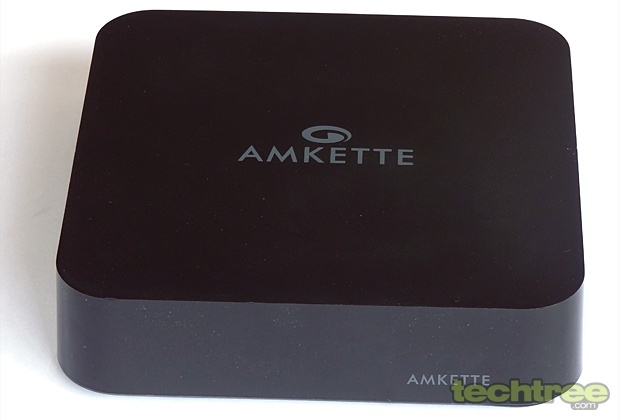 At its current price of Rs 10,500, the Amkette EvoTV XL is a good buy for its sheer versatility and performance.